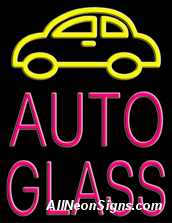 Auto Glass Neon Sign - Just like our simpler version without the automobile image, this neon auto glass sign will bring in customers who�ve suffered chips, cracks, leaks, or even worse incidents to their windshields. This neon beauty, however, further drives home the point with the addition of a glowing yellow automobile, reminding customers to maintain a safe ride by repairing or replacing damaged windshields. It�s a colorful and sizable sign that�s sure to attract drivers� attention.